By now many of your readers may have already given up on their “get in shape” or “get organized” New Year’s resolutions. But it doesn’t mean that it’s too late to make a new one that they might actually be able to keep and love: try new beers. To get them started, we recommend Indio, which has been available in the US for less than a year. This dark Mexican beer is known for its malt character and light caramel aroma, and has been brewed and distributed by Cervecería Cuauhtémoc Moctezuma in Mexico since 1893. Indio is available at retail, bars and restaurants in different markets across the U.S. If you haven’t tried Indio and would like to make it a part of your own “new” New Year’s resolution, I’d be more than happy to send you samples for your tasting and review. Since I am always willing to try a new beer, I decided to accept Berenice’s generous offer. My real motivation for wanting to try these beers is that I have yet to drink a Mexican beer that I truly enjoy, so upon reading the Indio description, I was instantly intrigued. In addition to the samples of Indio, we also received samples of Tecate and Bohemia, hence the word trifecta in the title of this post. Indio is a dark-colored beer with lighter shades of sweetness that reduce their level of bitterness, because its unique flavor offers a very special combination, the characteristics of the force and intensity of land beers made for cold weather like the Europeans with freshness and transparency that are customary in essentially warm countries like ours. Appearance: Clear, reddish brown color. Zero head retention and lacing. Aroma: Not much of a nose. Maybe some faint malt (tea biscuits?) and a hint of lemon. Taste: Thin and watery with very little carbonation. Quite bland with a hint of malt sweetness and little to no bitterness. Conclusion: The darker color suggests some rich, roasty malts, but unfortunately, all I’m getting is a bland lager. The nicest thing I can say is that it might be refreshing on a really hot day. Then again, so is a glass of water. Appearance: Clear, reddish amber. Nice fluffy head and good lacing. Aroma: Malt, citrus and a faint hint of hops. Taste: A little like a watered down beer; thin and no carbonation. Overly sweet with none of that hoppy tang bite. Conclusion: This is supposed to be a Märzen style beer so while it is certainly had a mild hop flavor; it lacked all of the toasted malt flavor as well. Maybe there was some problem with shipping from Mexico or maybe the beer was just a little beyond its born on date but the bottles seemed a little flat. If that is not the case, then this is a very mediocre beer. Tecate is a pilsner beer characterized by a robust body with a balanced flavor. Made with 100% natural ingredients that gives the consumer a high quality balanced flavor. Appearance: Liquid gold in a glass with not much in the way of foam or lacing. Aroma: Once again, there isn’t much in the way of aroma. MAYBE a hint of citrus, but I’m really reaching hear. Taste: More of that thin and watery mouthfeel again. Light and fizzy carbonation. Good bit of sweet malt with a smattering of bitterness for balance. Wet cardboard aftertaste. Conclusion: While it was better than the Indio, that’s not much of a compliment. A forgettable beer. Appearance: Clear, yellow gold with a quickly dissipating head and some lacing. Aroma: Sweet, doughy or yeasty and not much else. Taste: Like the Indio, it is a bit flat and watered down. A little sweetness in the front and then just the faintest hint of something to neutralize the sweetness. Conclusion: This was very reminiscent of a mass produced beer; wet, somewhat refreshing but otherwise unremarkable. I paired the Tecate with a cheesesteak and it did its job; it was a good complement to the meal. His personality is known for its rich aroma and a rich, full flavor, the result of a craft in which they operate only ingredients of the highest quality. Appearance: Clear, golden yellow color. A big goose egg as far as foam and lacing goes. Aroma: I hath stuck my schnoz into the glass and I hath plucked out a faint hint of lemon zest. That’s all she wrote! Taste: Slightly creamy mouthfeel with some light and fizzy carbonation. A hint of sweet malt with some mild hop bitterness from start to finish. Clean, crisp finish with a mild, lemony aftertaste. Conclusion: Much more flavorful than the Indio and Tecate. I recall having this several years ago during a 40th birthday trip to Playa Del Carmen, Mexico. From what I remember, it paired very nicely with the Taco Al Pastor that I ordered at a bar in the center of town. I liked this beer then, and I like it now. It’s not a great beer by any stretch, but it’s a definite step up from the usual Bud/Miller/Coors product. Appearance: Clear, yellow gold (about two shades lighter than the Tecate) with a little bit of quickly dissipating foam and some lacing. Aroma: Malt, earthy (grasses, heather) and a hint of citrus. Taste: A little thicker with some carbonation. A decent balance between sweetness and bitterness but still lacking in any really, interesting taste. Conclusion: As a German Pilsener, I was expecting this to be good bit hoppier. Instead, I was treated to another beer with a rather muted flavor profile. It was a notch above a mass produced beer. Many thanks to Berenice Gonzales of FORMULATIN for sending us these very generous samples! As you point out, the best part of these beers are context-dependent. I’d never pick these up in a normal situation, but wouldn’t complain about drinking them on a hot, summer day. Then again, that’s the kind of climate these beers were made for! Based on your notes, it’s easy to see why they have a hard time breaking through with American drinkers. I suppose it also doesn’t help that Corona really owns that kind of market share. Exactly! Though I would argue that there are way better summer beers out there with equal thirst quenching ability and tons more flavor, ie 21st Amendment Hell or High Watermelon Wheat, Brooklyn Summer Ale, Victory Prima Pils, Ayinger Brau Weisse Hefeweizen, Unibroue Ephemere, and of course a Dogfish Head Festina Peche. That being said, having a Corona on the beach in Playa Del Carmen on a 95 degree day in July was pretty fabulous too. Though truth be told, I was delirious from the heat at the time! First of all, that picture is hilarious. 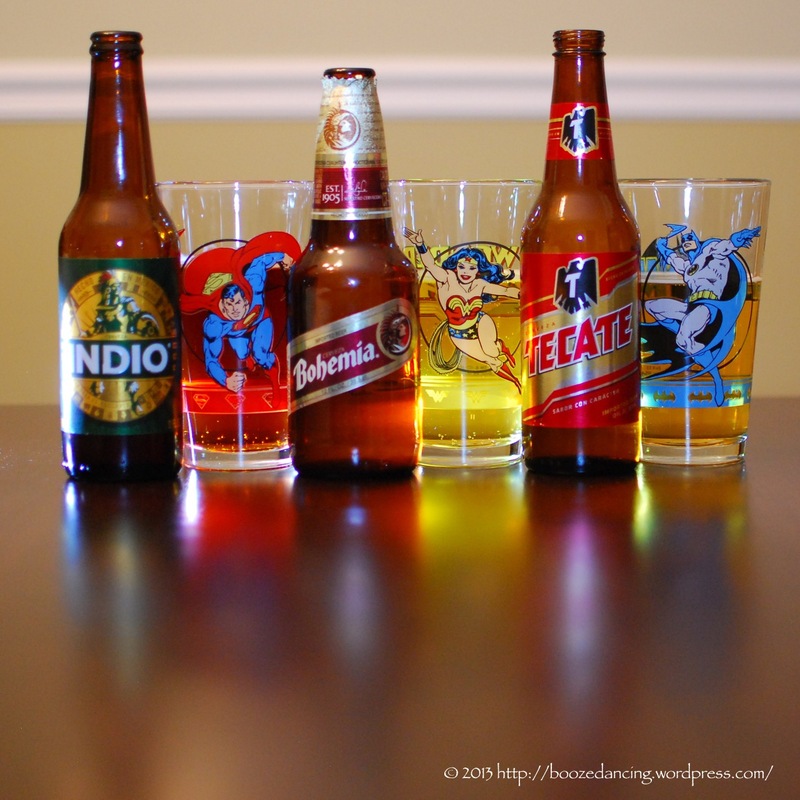 I’m cracking up at the choice of Justice League glasses for Mexican beer. Second, I’ve never had Indio, but it looks like Hawaiian Punch in that glass. Third, I’ll echo Bryan’s comment about context. Generally speaking, like you, I’m not a fan of the Mexican beers that I’ve had. But there’s something magical about it all the same. When I was in college, I went to Mexico for a week and I can’t imagine drinking anything other than Tecate in that time. It was perfect for the time and place. Similarly, through some perverse superstition, I am 100% convinced that my devotion to Negra Modelo in October of 2011 is the reason the St. Louis Cardinals won the World Series. It’s not a good beer at all. But I’ve only drank it regularly for one month of my whole life… and it just happened to be the most insanely lucky month of my life as a Cardinals fan. So despite the beer’s quality, I have fond memories of it. You my friend are a bad bad man! First you are getting into trouble for urinating on someone’s tire during a Maker’s Mark bender, and now you’re using baseball as an excuse to consume vast quantities of mediocre to poor Mexican beer. I say again, you are a bad bad man! Those beers don’t deserve that picture – it’s too good – too well thought out – too well done. None of the subject cervesas can claim the same properties. They’re uniformly horrid. That said, I was honored to to have been randomly gifted with samples of each (OK, dishonored is probably more accurate). There is something to the context observation though. I spent a few years in Southern California and had a Corona or two while there. They were terrible then – more terrible now – but they fit. Jamaica pairs well with Red Stripe and fiery jerk cuisine but I wouldn’t pour a Red Stripe anywhere else but into a drain. Great review (as usual). Cheers! Ah yes! Red Stripe goes very well with it’s native cuisine. As does bottled Guinness. And if you’re going to have it outside of Jamaica, it can only happen at the Jamaica Jerk Hut in Philly and it has to be super humid out. It’s all about the context after all. Context is always important. We have had our share of “lawnmower beers”. Or, beers to drink while vacationing on the sun. One more thing … why do I always get the Wonder Woman glass? You always get the Wonder Woman glass? Really? Fabulous photography here. Love the DOF blur. Thanks! I try my best to add some visual flare to these things. Keeps me motivated! Pity the beers were lacking this time around.